Do you have a pet loving friend who's hard to buy for? 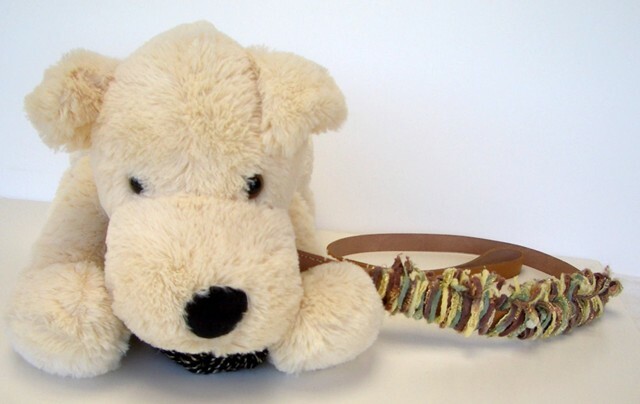 How about a fringe leash for their furry friend? These days people have birthday parties for their dogs - This chic one of a kind fringed leash would be a great birthday gift for dog or cat and make their human proud! To make this fringe: Set up My Own Fringemaker. First experiment with your scrap yarns to see which hole positions the rods should be placed on the rod unit for your project. Position rods in holes far enough apart to accommodate the width of the leash plus slack for sliding over the snap. Sew the fringe off center between the rods so the loops would accommodate the leash width plus snap. IDEA #1. Add in reflective tapes or threads as you make your fringe. When the dog and owner are walking at night the reflective tape on the fringe leash reflects vehicle headlights. IDEA # 2. Wouldn't fringe leashes be a cool fund raiser for local animal shelters? This idea could be your next project to sell and make money! My Own Fringemaker can put money in your pockets. View other fringe and tassel ideas for home and fashion in our Gallery. Learn how to make fringe with My Own Fringemaker, watch our free videos. Click the ADD to CART Button to purchase My Own Fringemaker and check out using our secure server.